I’ve heard it said—though it turns out not to be true—that prisons in our country look to State standardized reading scores of third graders in their region when calculating the number of future beds they will need to build, or free up, to house such young prisoners-to-be. Just the mere thought of this, the crude possibility of this invented truth—the fact that this is a fiction that feels like it could be true—leaves me shaking my head. Think for a minute about the connection that is being made here: the pipeline between literacy, or lack thereof, and time spent behind bars. That said, I have never taught in a prison, have never set foot inside such a place. But I do teach here in Detroit, have taught writing in the Detroit Public Schools for the past 23 years, and I am lucky enough to teach third graders, many of whom, I often learn, through their writings, know people, family members, who are living inside such places. Fact is, if I had to choose a grade where I think students are most open to the kinds of teaching that I do—creative writing, poetry writing, writing that follows no standardized rules, writing that resists any kind of figurative cage—third graders are my favorite age to teach. This poem, I think, captures why. It’s true: who would be “happy in a cage?” Who among us would not “burst out and rage”? I recently received a letter from an inmate at a prison in northern Michigan, from a prisoner—Fred, who is also known by a specific six-digit number—who is serving a life sentence and has turned to poetry as an act that gives his life behind bars a new meaning. But is black hoodies worse than white collar? it’s the key to my shackles. set me free, free my vernacular. let my pen write words that I wouldn’t say. let my pen crack the code to my internal safe. I hope that what Fred is saying, the claim that he is making, is true: the belief that my students, some in the third grade, others about to graduate from high school, will never find themselves behind bars, will never find themselves in situations where they do things that they shouldn’t be doing, or find themselves in the wrong place at the wrong time. But the truth is, in 23 years of doing what I do, of putting young people in situations where I know they will be successful, where I am confident that they will be able to do this thing that I am asking them to do—to write a poem. “It’s just a poem,” I hear myself say. “There is no right or wrong way to do it!”— I am sadly certain that some of the third graders that I’ve taught over the past two decades of my teaching—children who at one time sat in a classroom and looked inside their pencils with me, who believed alongside me that that they could see inside that windowless place, children who I told anything was possible, that whatever they said that they saw the world would believe it!—some of those children, now grown up, have grown up and done bad things, the wrong things, and at their worst, maybe they have—I wish I didn’t have to say it—even taken somebody else’s life. Maybe some are in prison right now, looking inside what dark place I cannot imagine. It’s probable, not just possible, that in the years since they were nine or ten, they haven’t written another poem, or seen that kind of inner light, since the well-lit days of a third grade classroom. Sometimes, I hate to admit it, not even a poem can save or change a life. Sometimes no matter what we say or do, someone else is going to say or do something that, in the moment, says it louder, or better, or say what makes more sense than what we once said. And in the end, it’s as if what happens, what gets done, or undone, would have happened no matter what. This, of course, breaks my middle-aged heart. It’s possible that in the cell next to Fred is a young man who once looked inside his pencil and believed in the possibility of what he saw there, who once wrote that a poem is a tree that never loses its leaves, or that love is a bird with a broken wing that still finds a way to fly. And sing. Fred’s words matter to me too. They have moved and readied my soul. They are deeds that, even though they might not wash away whatever actions he may have done, years ago—those other deeds that led him to the life and the life sentence that he is living inside of right now—his words tell me that what I am doing, inside the classrooms of Detroit, is important work and that “these young students of yours will never be students of mine (in prison)…” And that, I’ve got to believe—I can’t thank him enough for saying so—matters more than Fred will ever know. 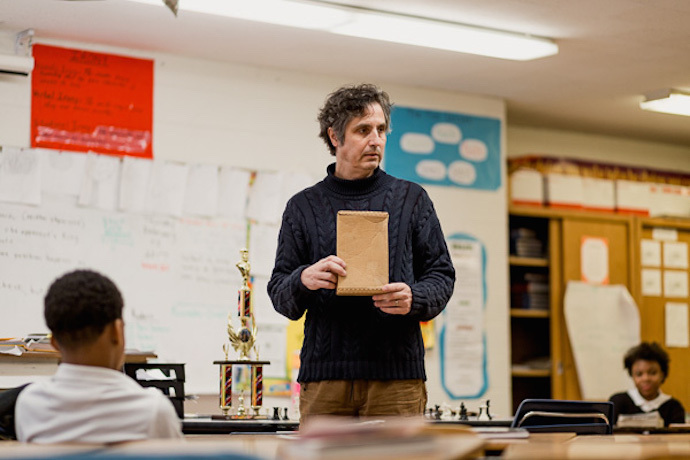 Peter Markus is the Senior Writer with the InsideOut Literary Arts Project of Detroit and is the author of several books, the most recent of which is Inside My Pencil: Teaching Poetry in Detroit Public Schools.